As this gorgeously photographed historical travelogue began, I kept trying to give host Brian Sewell the benefit of the doubt. After all, I have a particular fondnesss for British fare to the extent that I've become someone who has even grown to enjoy that particular push and pull of feeling both extremely intrigued and terribly repulsed by Gordon Ramsay's antics to the point that I just can't stop watching his shows. 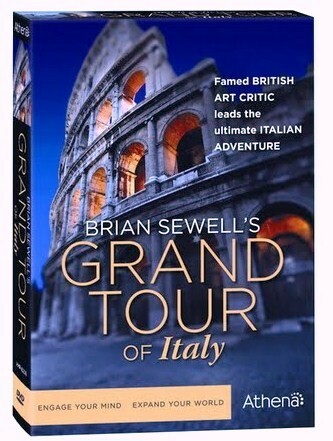 Thus when it came time for Brian Sewell's Grand Tour of Italy, I was determined to get to the root of Sewell's grumpiness or at the very least just try to ignore it and have fun. Unfortunately, the result became a guessing game that took away from the beauty of the Italian scenery and culture of the series. Yet the blame for this is not with the particular undisputed scenery and culture on display as Italians have produced some of the finest works in history but the fact that surprisingly our host seemed to hold them in such little regard is what plagued me endlessly. You know you're in trouble within minutes when you question just why on Earth he'd decided to choose this particular assignment to take on since throughout the production Sewell often made condescending remarks about the Italian race (aka my descendants) by implying that the Italians were of an inferior or lower class. However, similar to Simon Schama whose recent work about America also had the subtext that perhaps he may not be the world's biggest fan of the subject matter-- despite his interest and expertise-- Sewell clearly knows his stuff. And to this end, he delights (as far as I could tell) in revealing the world's most bizarre bits of trivia throughout this ten episode set which was transferred to four slim-packaged DVDs in a high-quality offering from Acorn Media and Athena that boasts a 20-page viewer's guide to celebrate the work as one that promotes lifelong learning. Sewell's journey through Italy follows the historic "Grand Tour" initially embarked upon during the completion of the education of young male British aristocrats who came to Europe under the guise of becoming more refined. While they definitely engaged in studying the classics where the fine arts were concerned, Sewell springs to life when he gets to abandon his art historian hat for a moment and turn into a male version of Gossip Girl, relishing in the most scintillating, lascivious, scandalous, and some downright disgusting play-by-plays of their escapades which consisted of hedonistic abandon, sexual debauchery, gambling, and gluttony. Yet although he dutifully follows the traditional Grand Tour in painstaking detail, he does so in a manner that seems as though he's either auditioning to portray Henry Higgins or try to get hired for work on an audiobook as a stereotypical stuffy aristocrat since disturbingly the sense that the country of Italy, the Italian race, and its culture are treated by the host as though it's completely beneath him. However there could be a reason for this discomfort on film or in the special since to his credit he definitely livens up during the wit filled gossiping segments or when oddly objectifies Italian men with strange comparisons to "macaroni" and describing the way they stand with their feet at three o'clock. Still, sadly, Sewell is never a warm host nor does he come across as someone you'd actually want to be around for more than a few minutes at a time which makes the length of the documentary quite a test of one's patience since he seemingly goes out of his way to make backhanded compliments to the Italian artists he's there to praise. Several times I kept thinking that unfortunately in addition to this wonderful set having been produced as an outlet for those seeking additional knowledge, it was also hopefully intended to help offer a worthwhile celebration of a country. In fact, as such a popular tourist destination-- no doubt it's one that so many of us would love to see but for some reason or another may never be able to visit either due to expenses, work, family duties, medical issues, etc. and therefore I wanted to yell at the television and by extension Sewell, "take a happy pill or look around-- you're getting paid to vacation in Italy, man!" However, we cannot judge a person themselves based only on subjective documentary footage so again, his unwillingness to loosen up preoccupied me once more. Likewise I found myself wondering if perhaps the yawns he was seemingly attempting to stifle were from the wicked jet-lag he'd experienced flying from his home base in London writing for the Evening Standard and offering his coveted advice to museums located on three continents. Needless to say his professional resume and brilliance as an award-winning expert cannot be disputed as the discs are chock full of worthwhile information. However, the fact that this time we couldn't blame the lack of grins or expression on Botox or pancake makeup but what just seemed to be an inability to celebrate "La Dolce Vita" definitely made Sewell's Tour far less Grand and instead one perhaps best appreciated with the sound turned all the way down.